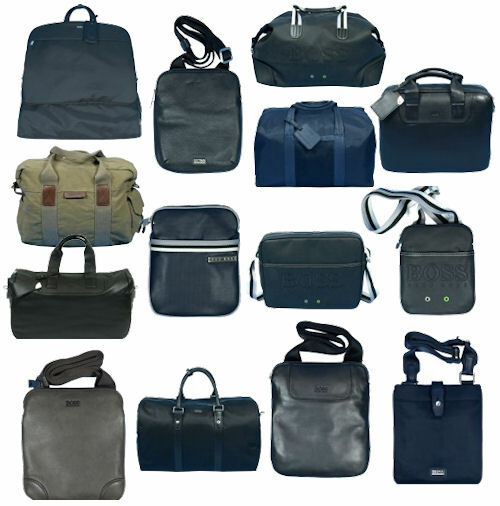 Tessuti have a great selection of Hugo Boss holdalls, shoulder bags, laptop bags and suit carriers for men, as pictured above, from the Hugo Boss Black, Hugo Boss Orange and Hugo Boss Green collections. At the time of writing, the Hugo Boss Khaki Holdall, the small and medium sized navy shoulder bags and the navy holdall were reduced in the sale. Material: various – leather, cotton, polyurethane or waxed canvas, depending on the bag. Tessuti are stockists of a great range of Hugo Boss bags for men, including suit carriers, holdalls, weekend bags and messenger bags from the Hugo Boss Orange, Green and Black ranges. They are made from materials including leather, waxed canvas, polyurethane and cotton, and there is a bag for every occasion, whether it be business, pleasure or travel.